X Es frisst einfach alles und kann daher auch in verschmutzter Umgebung leben. Niemand beachtet es. X Il peut vivre dans les fleuves et les lacs pollués car il mange de tout. Personne ne se soucie de lui. X Come de todo, por lo que puede vivir en aguas contaminadas. Nadie le presta atención. X Si nutre di qualsiasi cosa, pertanto vive anche in fiumi e laghi inquinati. È un Pokémon di scarso interesse. X 무엇이든 먹기 때문에 더러운 강이나 호수에서도 살 수 있다. 누구도 주목하지 않는 포켓몬이다. Y Das schäbigste Pokémon von allen. Es lebt auf dem Grund von Flüssen, wo viele Wasserpflanzen wachsen. Y Son apparence est pathétique. Il forme des bancs dans les rivières riches en plantes aquatiques. Y Es el Pokémon con peor aspecto. Vive en grupos en lechos de ríos con abundantes plantas acuáticas. Y Il Pokémon più sciatto. Vive in grandi gruppi nei letti dei fiumi ricchi di piante acquatiche. Y 제일 볼품없는 포켓몬이다. 수초가 많은 강바닥에 한데 모여 살고 있다. Omega Ruby While Feebas’s body is in tatters, it has a hardy and tenacious life force that enables it to live anywhere. However, this Pokémon is also slow and dimwitted, making it an easy catch. Omega Ruby Obwohl Barschwas Körper zerfetzt ist, besitzt es eine harte und zähe Lebenskraft, sodass es überall leben kann. Aber dieses Pokémon ist langsam und dusselig. Daher ist es leicht zu fangen. Omega Ruby Même si le corps de Barpau est en lambeaux, il reste tenace et obstiné, ce qui lui permet de survivre partout. Cependant, ce Pokémon est très lent et un peu bête, ce qui en fait une proie facile. Omega Ruby Aunque Feebas tenga el cuerpo mellado, posee una tremenda y constante fuerza vital que le permite vivir en cualquier lugar. Con todo, es un Pokémon lento y simplón; es fácil de atrapar. Omega Ruby Sebbene abbia il corpo logoro, Feebas è molto tenace e resistente, potendo così vivere in ogni luogo. Tuttavia, questo Pokémon è anche lento e poco sveglio, il che lo rende una preda facile. Omega Ruby 몸은 엉망이지만 어디에서든 살아갈 수 있는 끈질긴 생명력을 지닌 포켓몬이다. 하지만 아둔해서 금방 붙잡힌다. 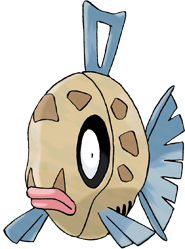 Alpha Sapphire Feebas’s fins are ragged and tattered from the start of its life. Because of its shoddy appearance, this Pokémon is largely ignored. It is capable of living in both the sea and in rivers. Alpha Sapphire Barschwas Flossen waren schon immer zerfetzt. Wegen seines merkwürdigen Aussehens wird dieses Pokémon weitgehend ignoriert. Es kann sowohl im Meer als auch in Flüssen leben. Alpha Sapphire Les nageoires de Barpau sont abîmées et déchirées dès sa naissance. Ce Pokémon est généralement ignoré à cause de son apparence miséreuse. Il peut vivre dans la mer ou en eau douce. 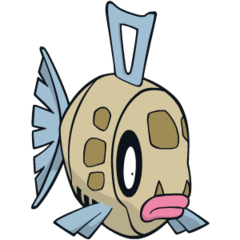 Alpha Sapphire Feebas tiene las aletas melladas y rasgadas desde que nace. Debido a este aspecto poco imponente, son pocos los que lo tienen en cuenta. Este Pokémon puede vivir tanto en agua salada como dulce. Alpha Sapphire Le pinne di Feebas sono logore e sbrindellate fin dalla nascita. A causa di questo suo aspetto disordinato, il Pokémon è solitamente ignorato. È in grado di vivere in mare e nei fiumi. Alpha Sapphire 태어날 때부터 지느러미가 너덜너덜 보기 흉해서 아무도 상대해주지 않는 포켓몬이다. 바다와 강 양쪽 모두에서 생활할 수 있다. Sun A tough Pokémon that is perfectly fine even in dirty water. However, due to its ragged, shabby appearance, it isn’t popular. Moon Although unattractive and unpopular, this Pokémon’s marvelous vitality has made it a subject of research. Ruby Feebas's fins are ragged and tattered from the start of its life. Because of this shoddy appearance, this Pokemon is largely ignored. It is capable of living in both the sea and in rivers. Sapphire While FEEBAS's body is in tatters, it has a hardy and tenacious life force that enables it to live anywhere. However, this POKeMON is also slow and dimwitted, making it an easy catch. LeafGreen Ridiculed for its shabby appearance, it is ignored by researchers. It lives in ponds choked with weeds. Diamond It is famous for its shabby appearance. While populous, they tend to cluster in set locations. Pearl It eats anything, so it can even live in polluted streams and lakes. No one pays any attention to it. Platinum It is a shabby and ugly Pokemon. However, it is very hardy and can survive on little water. HeartGold It is the shabbiest Pokémon of all. It forms in schools and lives at the bottom of rivers. SoulSilver It is the shabbiest Pokémon of all. It forms in schools and lives at the bottom of rivers. Black It is a shabby and ugly Pokémon. However, it is very hardy and can survive on little water. White It is a shabby and ugly Pokémon. However, it is very hardy and can survive on little water. Black 2 It is a shabby and ugly Pokémon. However, it is very hardy and can survive on little water. White 2 It is a shabby and ugly Pokémon. However, it is very hardy and can survive on little water.